(Skovshoved, Denmark)- The Danish J/70 Sailing League created their Youth League two years ago and it continues to grow in popularity with young kids at sailing clubs across Denmark. The combination of young girls and boys competing on the water and socializing ashore has made it fun and exciting for them. Last weekend, they enjoyed great sailing with racing managed by the Skovshoved Sailing Club. This year, it was the YOUNGSTER II team that won the event at Skovshoved- the second time they have done so. The team consists of brothers Jeppe & Nikolaj Borch, Amanda Ulmdal, Mathias Rossing and Nikolaj Rasmussen. The second place SUNDBY MARLINS, consisting of Josefine Boel Rasmussen, Kristian Schaldemose, Søren Andersen and Marc Wain, beat their previous best position in the Youth League by taking a podium for the competition. Before the competition, the team hoped for lots of fun and good wind, and they got what they came for! With only one point separating the other teams on the podium, the game was a tough battle through the final race. The BANDHOLM WHITETAILED EAGLES team, that included skipper Bo Schulein, Ole Lindberg, Christian Torp and Peter Ammundsen, ended up landing on the podium at the last minute, even though they nearly threw away that opportunity several times. Sunday’s last race 4th place was due to the fact they had to do circles to exonerate themselves from a penalty incurred during the race; had they taken 5th, they would have finished 5th! The balance of the top five included the DTU SAIL RACING TEAM in 4th place and the THURO PIRATES in 5th position. 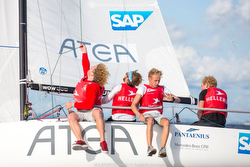 Follow the Danish J/70 Youth Sailing League here on Facebook For Danish Youth Sailing League video highlights For more Danish J/70 Sailing League information Add to Flipboard Magazine.